A new baby at home will bring you and your family joy and laughter. However, this monumental moment will also bring dramatic and drastic changes in your daily routine and so with your dog. 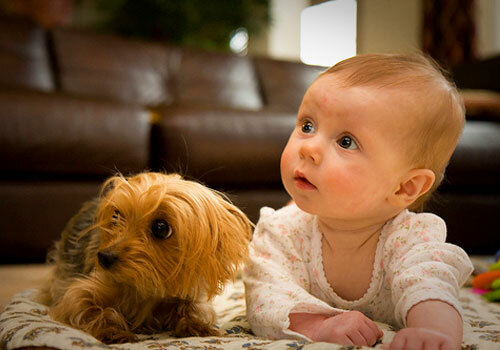 New parents often wonder, how to introduce dogs to baby? Basically, our dogs tend to be our fur babies (that is why pet owners nowadays are called fur parents). We treat our canines as our first babies and chances are your dog knows he is! We know how very in tune they are to us so your dog probably sensed that something is up with your pregnancy. After giving birth, your dog will experience a whole new routine, new sounds and smells. This can upset her, especially if she hasn’t yet spent time with children before or while growing up. Apparently, like humans feel, your dog may have a difficult time accepting all the sudden changes if she’s been the “only child” of the family for a while. So you will need a proper plan to introducing dog to baby. Let’s see what you can do to make this transition much smoother. What Is Involved in Introducing Dog to Baby? Just like human babies, dogs also feel insecure when they do not get enough attention or someone else stealing it from them. If not dealt appropriately, this can cause many behavioral issues in your dog, such as depression and anxiety. Let’s see how to introduce dog to baby so that they become lifelong friend instead of completing with each other for attention. An infant could be demanding for your time and attention hence, you will get to spend less time for your dog. To make things as comfortable as possible to everyone, preparing your dog for the new arrival in the family is necessary. You can start preparing your “first baby” months before you give birth and don’t wait until you bring your new baby at home. Your pregnancy period will serve as your dog’s adjustment period. Initiate the changes from his usual routine. They say that an old habit is hard to break, but nine months perhaps is enough to work with your dog and resolve with possible issues, change unwanted habits and establish your leadership. It is time to sign him up to become a well-behaved dog. You may seek the help of an expert to correct your dog’s behavior. When we say establishing new habits, your leadership is of utmost importance. A good verbal control over your dog is necessary when it comes to these particular skills. Sit, stay, settle and wait at doors. 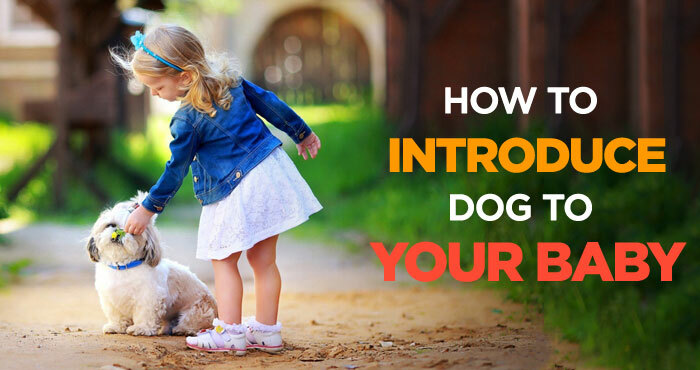 Dogs tend to be impulsive and it’s their normal reaction to jump up and greet you at the door. These skills will help you in future situations such as while nursing your newborn or coming home from the hospital. Leave and drop. It will teach your dog to leave baby’s toys and other stuff alone. Come when you only call him. Apparently toddlers and kids do unpredictable things most of the time. They create sudden movements, loud noises, screeching sounds, shriek or will even pinch your dog’s face. Thus, exposing your dog to tots is very helpful. Take him to the park and see how he reacts to children from a distance. Also, this will get him used to the sights and sounds of children around. According to Victoria Stilwell, host of Animal Planet’s It’s Me or the Dog and also a dog trainer, your dog may feel the changes, but he won’t really understand why the walk in the park that he surely enjoys for almost an hour becomes shorter so it is better to get him used to a new routine. Your dog could be sensitive to strange noises thus, it can make him feel anxious or stressed when the baby cries. To get him familiarized with it, record realistic baby noises online or purchase it and play it frequently in advance. While playing the sound, give him some treats or attention, then turn off the recording after 10 minutes. Ignore your dog for the next half an hour or so, then repeat the process. Hence, instead of becoming upset or agitated when the baby cries, your dog will look forward to it and anticipates treats! Though it may look silly, a doll can help you in an active preparation of your dog. Carry it around the house as if it is the infant. Set-up the crib, bassinet or swing and put your doll in it. While getting him familiarized with a “sibling” around, you are also getting him used for baby items and gears. Betsy Saul, co-founder of the website PetFinder.com suggests you let your hound do the investigation the way canines do best which is sniffing. Through this, he will be introduced to the scent and smells of baby powder, lotion and the likes. It will also help if you practice walking your dog while pushing your baby’s stroller. This will help him get used to baby wheels. Teach him the “back” cue by standing in front of him and shuffling your hand toward him to back up. Remember that consistency is the key. Always do these cues for the next few months and while training him, don’t forget to give him a treat or a pat on the back. A month before your due date it is critical for you to set clear boundaries. This will engage him in the process of respecting you, the baby and the baby’s things. Hold an item and allow your dog to sniff it, but from a distance. It will establish the thought that the thing is yours and he shouldn’t play with it. Below are other practices you should try. Conditioning your hound to be off-limits with the nursery. You may still allow him to sniff and discover new things in the room, but with your supervision. This will set an invisible barrier that your dog is not allowed inside and that he should leave when you instruct him. Repeat this practice before the baby arrives. Previously, you have thought your hound to be calm and well-behaved so controlling the introduction will be easier. Make sure to drain your hound’s energy by taking him for a long walk. Upon returning, he will notice a new scent in the house and he could be familiar with it. If you or your partner is holding the baby, be in a complete calm state. 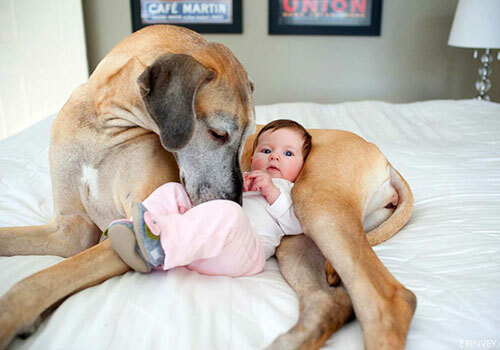 Allow the dog to sniff the baby from a distance and do not bring the newborn too close. Eventually, they will get closer to each as they grow up. Control your dog’s movements and interaction with the baby by teaching him to go away whenever you ask him. This cue will be very beneficial, especially if the baby can crawl and your dog seems uncomfortable with it. Dogs are intelligent, but not all of them know that moving away could be an option. Teaching him to simply walk away whenever he feels uncomfortable or stressed in a situation with the baby, he won’t feel anxious that will cause him to growl! By instituting new rules at home, you are also helping your dog to adapt to sudden changes in his daily routine and privileges. Establish your dog’s new habits such as sleeping in a dog pen, keeping his paws on the floor or relaxing in his crate while the baby is crawling around the house. Also, it is essential to train your dog to be quiet, especially if the baby is taking naps or when you are nursing her to sleep. Throw him some treat or puzzle toys to spend time while in his bed. This will practice your dog to stay in his spot during quiet sessions. Early preparation is the key so start preparing your dog for the new arrival in the family months before your due date. This will be less stressful for you and your dog and you have better chances of successful transitions and habit changing. Resist yourself from giving him extra attention weeks before the baby’s arrival. Be self-conscious about it to avoid setting him for a major breakdown when your baby comes and be the centre of attraction. Gradually give him less attention. However, amidst all the demands of having a newborn in the house, do not forget your dog and his needs. Exercise is their happy pill so make sure that he regularly has it. Ask a friend, a neighbour or a relative to walk your dog if you can’t. Your dog does not actually need special attention so they will feel important. Just maintain the routine, impose consistent leadership and take him for regular walks every day. Include him in some baby-related activities as well. Mikkel Becker of VetStreet.com recommends allowing your dog sit nearby while you are nursing your baby or changing diapers. Talk with your baby and your dog while doing it. 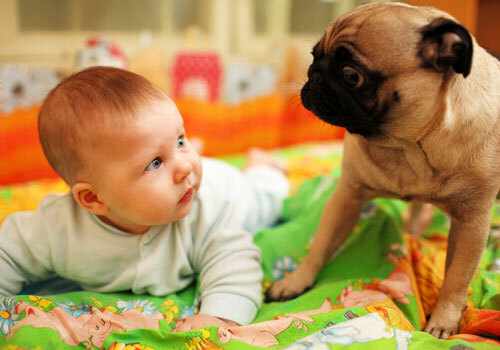 Eventually, your dog and your infant will become playmates in the future. Need more tips? Watch this video by Cesar Millan for some handy tips. 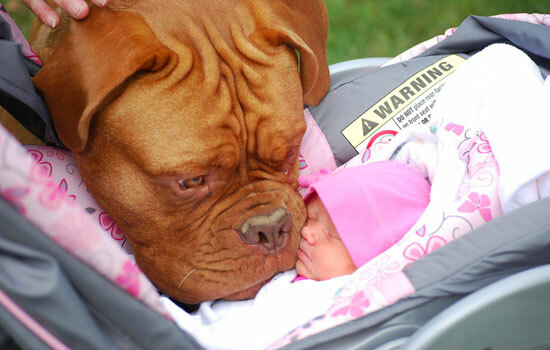 Never assume that dog breed alone can identify your baby’s safety. A cute chow or a small Pomeranian can impose harm to your baby. Aside from leadership, honesty is important. Can you still control your dog at all times? 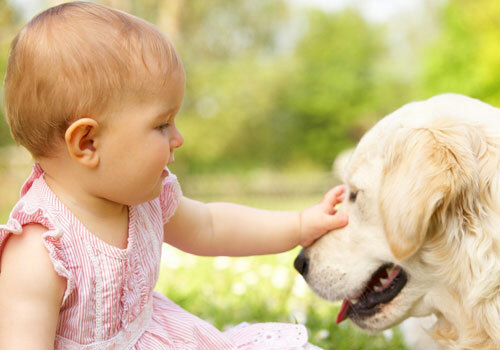 Your baby’s safety is our number one priority so after all the works and training and you are still not sure about your dog’s behavior. Find an alternative solution so you can both protect the welfare of your dog as well as your newborn. Interesting read. When I was pregnant with my first child, Sara I used a book called Tell Your Dog You’re Pregnant: An essential guide for dog owners who are expecting a baby. It was really helpful and came with a baby sounds and toy noises. Max (my fur child!) took some time to get used to the sounds but the book helped on how to do it. It gave me advice on what changes will occur and how to prepare my Max for them. It also talked about the causes for aggression and why it might occur and how to avoid it. It is written by a vet behaviorist too so it cover health issues as well – I got it from http://www.babyandpet.com.au or Amazon too i guess – maybe that will help someone else! Thanks Kaye for your suggestion. Tell Your Dog You’re Pregnant looks like a great book to help train a dog for upcoming baby.